If 2013 will go down in history as the year the Higgs Boson was discovered, then 2014 may very well be known as the year dark matter was first detected. 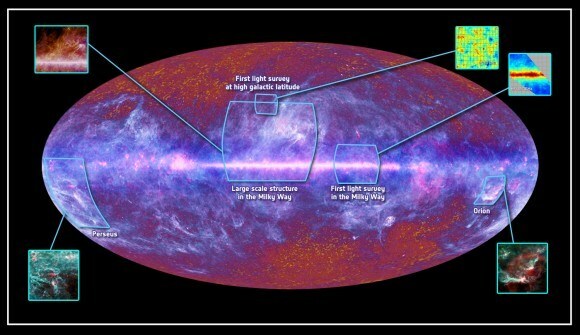 Much like the Higgs Boson, our understanding of the universe rests upon the definitive existence of this mysterious entity, which alongside “dark energy” is believed to make up the vast majority of the cosmos. Before 2014 rolled around, the Large Underground Xenon experiment (LUX) – located near the town of Lead in South Dakota – was seen as the best candidate for finding it. However, since that time, attention has also been directed towards the DarkSide-50 Experiment located deep underground in the Gran Sasso mountain, the highest peak in the Appennines chain in central Italy. This project is an international collaboration between Italian, French, Polish, Ukrainian, Russian, and Chinese institutions, as well as 17 American universities, which aims to pin down dark matter particles. The project team spent last summer assembling their detector, a grocery bag-sized device that contains liquid argon, cooled to a temperature of -186° C (-302.8° F), where it is in a liquid state. According to the researchers, the active, Teflon-coated part of the detector holds 50 kg (110 lb) of argon, which provides the 50 in the experiment’s name. 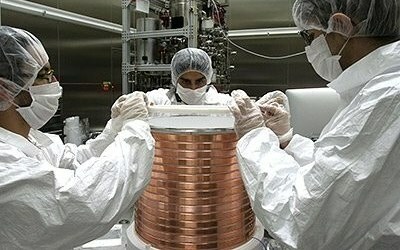 Rows of photodetectors line the top and bottom of the device, while copper coils collect the stripped electrons to help determine the location of collisions between dark matter and visible matter. 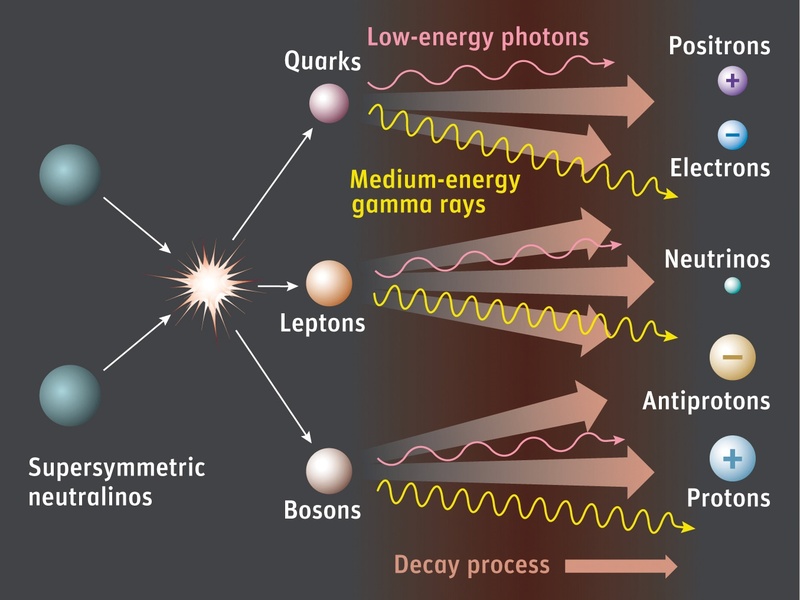 The research team, as well as many other scientists, believe that a particle known as a WIMP (weakly interacting massive particle) is the prime candidate for dark matter. WIMP particles have little interaction with their surroundings, so the researchers are hoping to catch one of these particles in the act of drifting aloof. They also believe that these particles can be detected when one of them collides with the nucleus of an atom, such as argon. By cramming the chamber of their detector with argon atoms, the team increases their chance of seeing a collision. The recoil from these collisions can be seen in a short-lived trail of light, which can then be detected using the chamber’s photodetectors. To ensure that background events are not interfering, the facility is located deep underground to minimize background radiation. To aid in filtering out background events even further, the detector sits within a steel sphere that is suspended on stilts and filled with 26,500 liters (7000 gallons) of a fluid called scintillator. This sphere in turn sits inside a three-story-high cylindrical tank filled with 946,350 liters (250,000) of ultrapure water. These different chambers help the researchers differentiate WIMP particles from neutrons and cosmic-ray muons. Since autumn of 2013, the DarkSide-50 project has been active and busy collecting data. 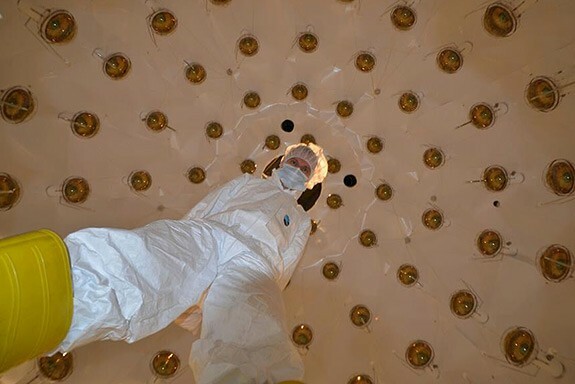 And it is one of about three dozen detectors in the world that is currently on the hunt for dark matter, which leads many physicists to believe that elusive dark matter particles will be discovered in the next decade. When that happens, scientists will finally be able to account for 31.7% of the universe’s mass, as opposed to the paltry 4.9% that is visible to us now.